It's natural to want to help your adult children financially, whether it's giving them cash for a down payment on a home, or helping them pay off their student loan debt. But don't make the mistake of shorting your own retirement funds while doing this. Your financial priority should be saving enough for your after-work years. If you want to help your adult children, too, that's fine — but only if you can afford to, and only if you set limits. Here are several rules you should follow when giving your grown children financial assistance. Student loan debt continues to grow for young people. According to data from the Federal Reserve Bank of New York, the national outstanding student loan debt stood at $1.36 trillion as of Sept. 30, 2017. It's tempting for parents to help their children with monthly student loan payments, especially if their children are recent grads still trying to find good jobs. But before you start helping your kids pay back those loans, take a close look at your own household budget to make sure that you can afford to help. Your budget should include the money you bring in each month and the money that goes out, including your spending on variable items like groceries, entertainment, and dining out. It should also include the money you need to put away each month for your retirement. If helping your children financially will cut into those retirement savings, either don't provide the help, or offer your adult children a smaller amount of money. Sometimes the best way to give your adult children financial support is to ask that they pay you back over time. Don't feel bad about helping your children with a loan instead of a gift — it's not unreasonable to ask your kids to pay you back, perhaps on a monthly repayment schedule that they can afford. If your children can't afford to pay you back now, agree that they will start repaying you once they land a better-paying job. If your adult kids are buying a home, giving them money gets a little more complicated. If you gift your children money for a down payment, they will need to be able to prove to their mortgage lender that the money is a gift, and provide a letter detailing that it does not need to be paid back. Then, there's the issue of gift tax liability: The annual gift tax exclusion is $15,000 per recipient. Giving your child anything beyond that means you will have to report it on Form 709 of your taxes. However, that doesn't mean you'll pay the gift tax right away. You can apply the gift toward your lifetime exclusion of $5.6 million in combined estate/gift tax exemption. Also note that each parent could gift $15,000 to their child and $15,000 to their child's spouse for a total of $60,000, before having to report the gifts to the IRS. Loaning your adult children a large sum for a down payment will also come under scrutiny by the IRS. If a formal arrangement is not made, and interest is not being paid, the IRS will view the funds as a gift and subject it to the gift tax rules outlined above. For a loan, a promissory note between you and your adult children should lay out the terms, including interest rate, repayment schedule, and any collateral. The interest rate on the loan should be at least as high as the applicable federal rates set by the IRS, or there could be further tax complications. If you're helping your adult children financially, it's OK to expect something in return. Adults still living in their parents' home should be expected to pay at least a token amount of monthly rent. They should also help pay for groceries and utility bills. Finally, make sure that when you help your adult children financially, you are helping them with something they truly need versus something they want. 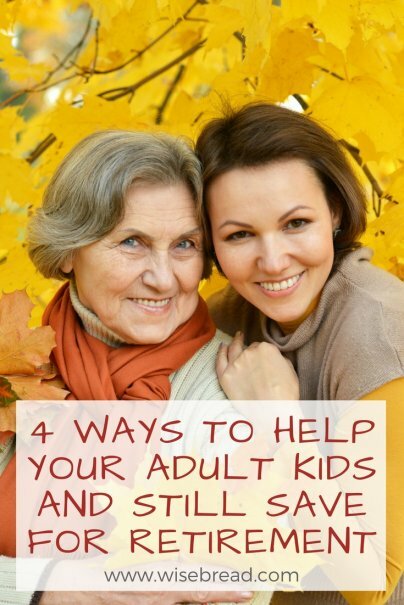 It's one thing to help your kid pay their student loans. It's another to help them buy the latest smartphone. It's OK if your children don't have the most powerful laptop or an expensive car. They can get those things after they've saved and built up their own financial health.